At the corner of Broad and Central Avenue is a gift store stocked from floor to ceiling with everything you can imagine - jewelry, skin products, clothing, posters, decorations, African and ethnic items and much more - something for everyone! Top Shelf has been a staple in downtown Newark since 1996 and the most interesting thing inside is Lubna Muhammad, the owner. If she looks familiar, she's also a staple at outdoor festivals and events in Newark and all the way down to Florida selling her wares to those that can't make it to Top Shelf. Lubna, a West Ward resident, created her own line of products called Ashea. There are nearly twenty different products in the line - they are all her creations and made from all-natural herbs and ingredients. How does she create these products? She declares, "She was raised "Green," before people really knew it was green. " She recalls making handmade soap in a large vat as a child and since then has been educated in herbal remedies and uses. Many products have also been created out of need for family and friends - for her husband a product to soothe razor bumps and her latest addition Daisy Love to help with age lines for herself (though she doesn't need it). Daisy Love was named after her Aunt Daisy who helped raised her, who taught her how to sew and make things and who was a thriving entrepreneur (before that word was really used). Lubna's positive energy and spirit are as contagious as the many scents she presents to her customers. 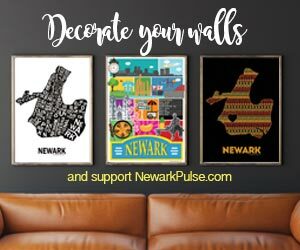 She is a true Newarker - supporting Newark organizations like WISSOMM, attending many community events, and even using the services of other Newarkers (her new labels were created by a Newark artist).